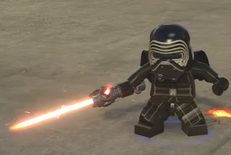 Kylo Ren is a Star Wars minifigure first released in 2015. 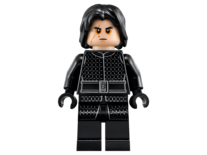 So far, there are two different variations of the Kylo Ren mini figure, both of which are very similar, except that the version that comes in Battle on Takodana has his actual face, where as the shuttle version just has his mask piece printed on the head and comes with an extra black hood so as not to reveal his identity before the movie came out. Both minfigures come with the same torso, legs, cape, and helmet. The torso is all black with grey printing. The lines describe a belt with a shiny buckle, and show Kylo's robes/armor, and the printing is continued to the legs, showing the end of the robes. There is also printing on the back of the torso, just continuing the lines of his clothes. His cape is a new "piece", short and tattered, made out of the new spongy cloth material. The helmet is once again black, this time with silver printing defining the eye holes and a few other details. 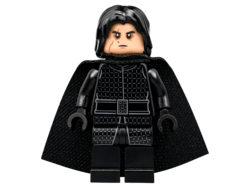 Kylo Ren's head is light nougat, or the standard flesh color for most mini figures. The head itself is double sides, with one side having a sort of scowl, with bags under the eyes, and the other with an angry snarl with teeth showing. The hair piece he comes with in Battle on Takodana is black, long, and shaggy. 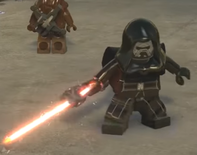 In both sets, he comes armed with his new crossguard lightsaber, with a dark silver hilt, and a new transparent red blade piece. Kylo Ren was a fallen Jedi who was a member of the Knights of Ren and the First Order. He served Supreme Leader Snoke, a individual who was considered to be a powerful figure in the Dark Side of the Force. Before he became Kylo Ren, he was known as Ben Solo, son of Han Solo and Leia Organa. This page was last edited on 6 January 2018, at 06:13.